Besides my Job as software developer I am engaged in design and manufactoring of amateur astronomical telescopes an their additional equipment. The project shown here - a Newtonian-type telescope on paralactic fork-mount - was finished in summer 2014. The final assembly was done in my observatory. With minor exceptions (friction wheels, drive worms, cylindrical gears) all mechanical and optomechanical components - including the main mirror - have been manufactured by me in my own workshop! A parabolic mirror, 14", focal ratio = 1:5.8 was ground when the project started. This 14"-mirror is an intermediate part and will later be replaced by a 20"-mirror (again self-made). The optical tube is a solid but lightweight Truss. With little constructional changes the system can be adapted for main mirrors between 14" and 20". 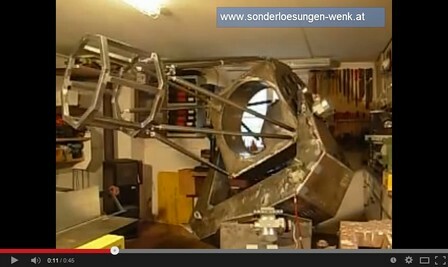 In case of switching to a mirror diamater above 14" only the secondary cage has to be replaced . Mirror cell with back ventilated 18-point mirror mount. The mount can carry mirrors between 14" and 20". Radially, the mirror is supported by Teflon-coated supports. The sled focuser can be adjusted precisely in three dimensions. In many parts a fork mount according to Ing. 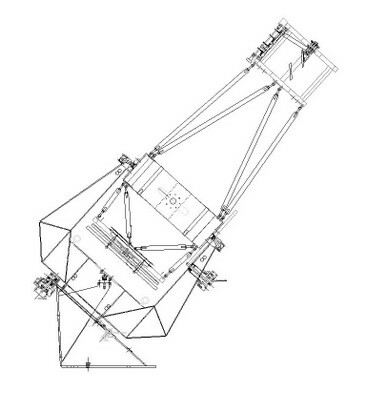 Rudolf Pressberger's "Austrian Precision Telescope Mount (ÖPFM)". This highly precise type of mount satisfies even professional demands. The original construction has been modified and adapted to my special situation. The system is designed to carry telescopes with main mirror diameters up to 20". Click into the image to watch a short video! The special - nearly frictionless - precision bearings keep the system rotating without any motor dirive - in this case solely pushed by hand! drive worms against cylindrical gears. This combination makes the system nearly absolute backlash free. The picture shows the readymade gear boxes for right ascension and declination. All do-it-yourself! This special mount does not have classical axles or expensive roller bearings - neither in declination nor in right ascension! Instead, optical tube and fork rotate in special bearings where a hard-chrome plated ball rests in a spherical PTFE-seat. This assures an absolute freeness of backlash and breakaway torque. In RA the friction wheel is not only a drive element but an integral component of the bearing! Having a diameter of 500 mm, the friction wheels fullfill the rule of thumb saying that the wheel-diameter should not be less than mirror diameter. As the drives do not have any worm wheels, the system is largely free of periodic errors. It is intended to equip the mount with high resolution encoders in order to bring the software ATTS - Advanced Telescope Tracking System (a joint project between Wenk Observatory Solutions and Richard Gierlinger) to service. ATTS provides highest positioning and tracking accuracy. It means astro imaging without autoguider, tracking and positioning by means of pointing models and much more! ... some pictures taken in the construction phase!